The theft of London's public sculptures reached a nadir last night, with the theft of Barbara Hepworth's Two Forms (Divided Circle) from Dulwich Park. The bronze work has stood in the park for over 40 years and was a local landmark. In all probability, it's now on its way to a black-market metal dealer, to be melted down and never seen again. Southwark Council have offered a £1,000 reward for information leading to arrests. 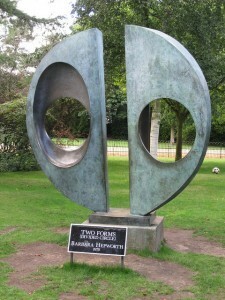 Barbara Hepworth (1903-1975) is one of Britain's most famous sculptors. Another piece by the artist can be found in Battersea Park, and she also modelled the angel-like structure on the eastern end of John Lewis, Oxford Street. The loss is the latest and most high-profile case of cultural abduction in the capital. Last month, a statue of Southwark hero Dr Salter was taken from Bermondsey river front. A month before, a war memorial was stolen from Twickenham. Only yesterday, the Metropolitan Police launched a new unit charged with tackling metal theft. The stolen sculpture and an attempted cable theft on the Liverpool Street lines today add urgency to their mission. Image by Zoe Craig in the Londonist Flickr stream.